Fine mapping of the Ug99 effective stem rust resistance gene Sr45 introgressed into common wheat from the D -genome goatgrass Aegilops tauschii. 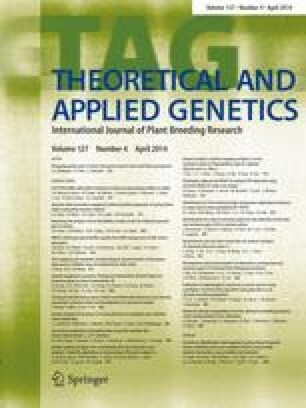 Stem rust resistance gene Sr45, discovered in Aegilops tauschii, the progenitor of the D -genome of wheat, is effective against commercially important Puccinia graminis f. sp. tritici races prevalent in Australia, South Africa and the Ug99 race group. A synthetic hexaploid wheat (RL5406) generated by crossing Ae. tauschii accession RL5289 (carrying Sr45 and the leaf rust resistance gene Lr21) with a tetraploid experimental line ‘TetraCanthatch’ was previously used as the source in the transfer of these rust resistance genes to other hexaploid cultivars. Previous genetic studies on hexaploid wheats mapped Sr45 on the short arm of chromosome 1D with the following gene order: centromere–Sr45–Sr33–Lr21–telomere. To identify closely linked markers, we fine mapped the Sr45 region in a large mapping population generated by crossing CS1D5406 (disomic substitution line with chromosome 1D of RL5406 substituted for Chinese Spring 1D) with Chinese Spring. Closely linked markers based on 1DS-specific microsatellites, expressed sequence tags and AFLP were useful in the delineation of the Sr45 region. Sequences from an AFLP marker amplified a fragment that was linked with Sr45 at a distance of 0.39 cM. The fragment was located in a bacterial artificial chromosome clone of contig (ctg)2981 of the Ae. tauschii accession AL8/78 physical map. A PCR marker derived from clone MI221O11 of ctg2981 amplified 1DS-specific sequence that harboured an 18-bp indel polymorphism that specifically tagged the Sr45 carrying haplotype. This new Sr45 marker can be combined with a previously reported marker for Lr21, which will facilitate selecting Sr45 and Lr21 in breeding populations. This work was funded in part by Borlaug Global Rust Initiative (BGRI) Durable Rust Resistance in Wheat (DRRW) Project (administered by Cornell University with a grant from the Bill & Melinda Gates Foundation and the UK Department for International Development); Australian Centre for International Agricultural Research (ACIAR), Grain Research and Development Corporation (GRDC), National Science Foundation Plant Genome Research DBI-0701916 (Principal Investigator, J. Dvorak). The first author acknowledges the University of Sydney for providing Endeavour International Postgraduate Research Scholarship. We are grateful to Sutha Chandramohan, Libby Viccars, Xiaodi Xia and Hanif Miah for excellent technical support. The experiments comply with the current laws of Australia.